An oceanic palate of blues, greens, and clean white emulating a Southern California aesthetic was used in the Thales 61,000-square-foot space. 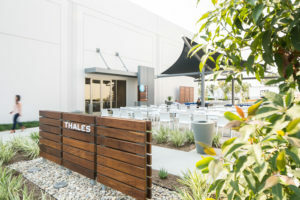 Ware Malcomb provided interior architecture & design, branding and civil engineering services for the 61,000-square-foot project for Thales Avionics, located at 53 Discovery in Irvine, California. It was designed to accommodate the firm’s strategic objectives while reflecting its values of collaboration, innovation and building a community at work. The design incorporates state-of-the-art technology in a flexible open work environment for both employees and visitors from around the globe. Adhering to the design standards previously developed by Ware Malcomb, the space appeals to a diverse demographic, especially the younger generation of engineers, while providing an efficient facility that embraces new ways for people to work and come together. 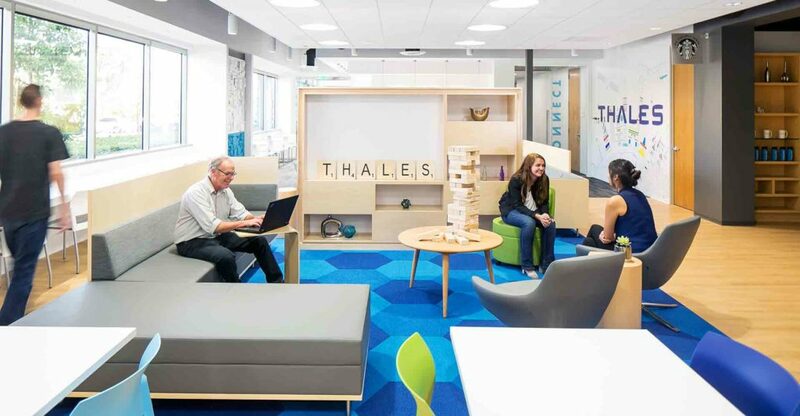 Ware Malcomb’s in-house branding studio successfully translated Thales’ corporate culture, products and client needs into the overall experiential design of the space. 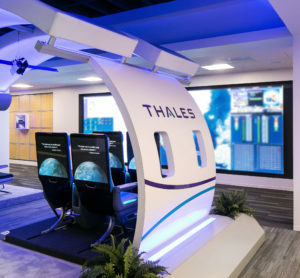 The result was a cohesive design that integrates artwork made from legacy inflight entertainment airplane parts, Thales’ corporate colors for a connection to the brand, wayfinding signage that reflects the Thales vernacular, and an oceanic palate of blues, greens, and clean white emulating a Southern California aesthetic. The branding was seamlessly incorporated into all aspects of the project including the office environment, Customer Experience Center, lab, work café and outdoor patio. 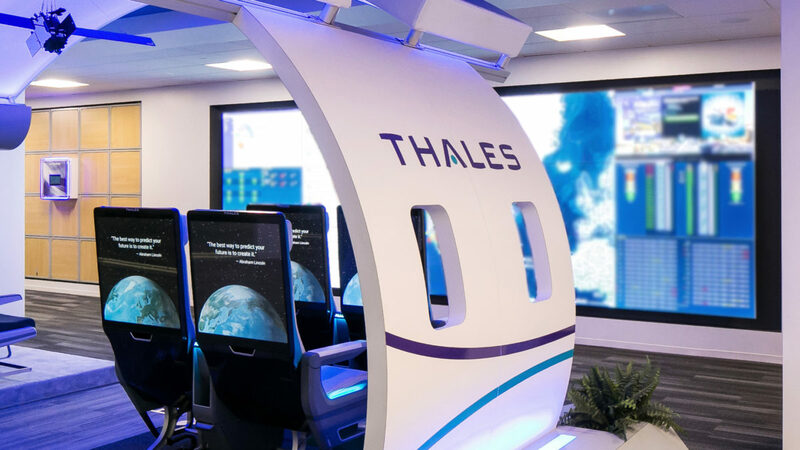 A highlight of the new offices is the Customer Experience Center, where Thales’ client base of major airlines are invited to participate and experience first-hand Thales’ innovative solutions. The Customer Experience Center is designed to accommodate Thales’ international clientele, enabling them to set up their own work space in small conference rooms, enjoy access to a coffee bar, snacks and refreshments, and utilize the business center and multicultural prayer room. The space features product displays, video walls, and breakout lounge areas with flat screens. Thales is a global leader in providing cutting-edge connected in-flight entertainment systems and services that enrich the travel experience. The design solution elegantly features a life-sized aircraft fuselage situated at the center of the demonstration area, creating the ultimate interactive experience for visitors. A full-service cafeteria with a professional kitchen was designed to create an inviting space to be used throughout the day for all campus employees. The café includes a coffee bar and a wide range of seating options for employees to utilize for impromptu collaboration and enhanced socialization. The General Contractor for the project was Turelk.